Stems: Stiffly erect, solitary or occasionally clustered, branched above, angled, ribbed, nearly glabrous below, usually woolly above. Leaves: Occur in basal rosettes and alternate on stems, stalked, 2-6 inches long and 1/2 to 3 inches wide, pinnately divided 1-2 times; segments linear, green and glabrous above, white-woolly beneath; tips pointed; upper leaves reduced, less divided, nearly sessile. Inflorescences: Cymes, panicle-like, flat-topped to rounded, terminal; heads 40-100, hemispheric, about 1/2 inch wide; bracts 6-14, petal-like, tips yellowish white to greenish white. Flowers: Ray florets absent; disk florets 20-60, corollas white to cream. Fruits: Achenes, small, 4-angled, short-hairy, tipped with 14-18 minute, blunt scales, enclosing small seed. 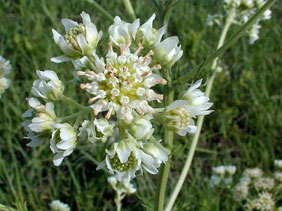 Habitat: Dry, open prairies, rocky hillsides, and roadsides, frequently in close proximity to limestone outcrops. Comments: Old plainsman is hardy and drought resistant. See also yellow plainsman Hymenopappus flavescens .